Planning a trip for three people can be challenging, to make it easier we each picked one thing we wanted to see or do. My mother wanted to see a broadway play, I wanted to go to the MoMA and my sister wanted to see the 9/11 Memorial. It’s not something I would have chosen as my “one thing” but off we went. I think created a sense of separation because I’m Canadian. I remember hearing the news in Toronto and I remember the fear but I also remember it feeling very distant, maybe to protect myself from the fear that it could happen to me. But as we walked closer to the area we all felt solemn as it seemed unbelievable that something so terrible could happen on the streets we were walking. There was a tremendous amount of security to get into the area with metal detectors and guards along the way. 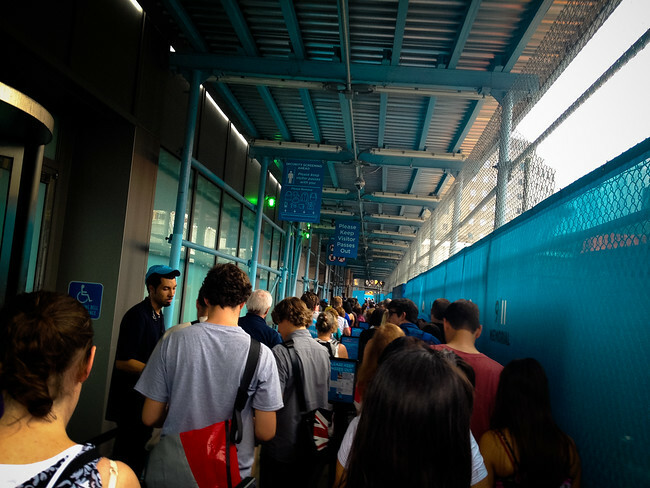 I didn’t know what to expect as we were shuffled through a maze of laneways to get to the destination. Feeling like a herd of cattle the sky opened up. The area, which is not yet complete, is park-like with two structures each representing a tower. Each square structure has the names of the victims enscribed in bronze around the edge, from there water falls into one reflecting pool, which then falls into another. There is a sense of peace. I was worried that a memorial would feel outlandish but the water felt powerful and yet at the same time created a sense of serenity and calm. More trees will be planted and it’s meant to convey hope and renewal. In fact one of the trees that now stands survived the bombing, it was removed and has been replanted. 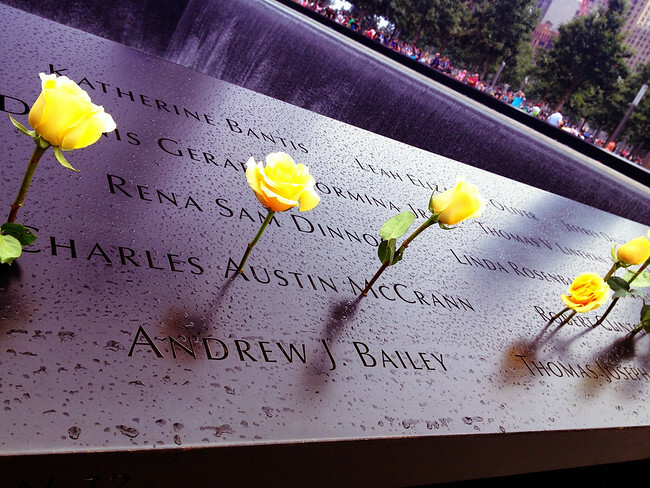 We walked around to read the named and it really hit home when we saw the yellow roses. These were no longer just names. Someone who cared about them had come to morning and place roses for them. I’m not sure if everyone felt or understood the soberness. We saw many people having their photo taken next to the monuments. I can only guess that this is a cultural difference and they didn’t understand what they were doing seemed so insensitive in my mind. The memorial is free to visit, but you need tickets which you can book online. It’s something I’m really glad Ryan wanted to do because I would have never seen this on my own. I no longer feel that sense of distance. « Food Friday: Best pizza in New York? Looks like you were there when there was a much less crowd then when I was – was it a rainy day? I wonder if those people getting a photo were the people who left the roses, and therefore knew those names? That would be the only way that kind of photo there would be ok. When I was there people were taking smiling selfies….which was just weird. It’s so well done, and I agree, a place of peace. I think it’s an important visit in NYC. It did rain that day. We saw lots of people getting their photo taken so definitely not just the ones leaving roses. It was strange. I worked next door to this area when it was just a gaping hole with fence around it (2006). The fences had photos of people who were killed in the attack posted all over them, and I’d see tourists taking snapshots in front of them. I always wanted to ask, would you take a photo smiling in front of someone’s grave? I feel no differently about the memorial. The smiling tourist shot is so bizarre in places like this. Obviously it raises a bit of irrational anger in me! Anyway, I’ve really got to get back there and see the memorial. It looks really beautiful. It would be nice to replace the image in my head of the nasty construction site with something so much more peaceful. You should go back, it was a really serene place. I thought it may be garish or sensationalized but the water and plans for trees will make it a really peaceful place. Great post. I am American and I too felt a sense of separation when the planes hit… as I’ve grown older I understand the impact of what did actually happen that day. Thank you for sharing. I think that may just be how we deal with things, to create distance. I haven’t been yet, but the next time I’m in NYC that will be my 1st stop. I can’t believe people would pose for pictures there. I don’t care what culture you come from, that is just rude!!! It is the only way I could possibly explain why they would feel okay doing it. It just seemed so tasteless that I cannot imagine an entire family doing it. The last time I was in NYC, I went to see the empty site filled with rubble. A visit to the memorial is on the list for my trip to NYC later this year. Make sure you get the tickets online and print them out, you`ll save yourself an hour waiting in line. It isn’t a place for posing for photos and some people just never get it. I don’t understand how you could go there and not feel something for what happened. Even if you came in distant, I think the actual area should affect you, just realizing the loss that happened there. There are some sites where maybe it was so long ago that people don`t realize, but this is fairly recent history. It was bizarre. Thanks so much! Definitely check out the memorial the next time you go, it`s sombre but important to visit. Like your sister, this is on the top of my list for my return trip to NYC. I’d not been to NYC to see the towers when they stood, but I did see the giant holes in the ground after. I really want to see how they’ve turned a place of such tragedy into a place of hope and remembrance. We all left feeling like they had done a great job. Instead of a memorial it seemed to remember but also be peaceful and forward-looking, if that makes any sense. Beautiful post. Gave me goosebumps. It is easy when something so devastating happens in another country to not allow yourself to feel its trauma. This memorial is not only a way for those families to remember, but for those much less affected to appreciate the suffering and respect and remember too. There is a really peaceful sense of energy there. I don`t think they could have done a better job. I really like reading accounts of non-Americans visiting this memorial. From what I’ve read, it sounds like it does a really good job of, as you said, closing the distance. I’m going to NYC next month with my mom and sister, and we are definitely planning a visit to the Memorial. We all vividly remember that day, and I’m interested to see how we all react to actually being there. Get your tickets online before you go and print them out. The line-up to pick up tickets is long! I can still remember sitting at home in England watching as the two towers, and so many precious lives, were stolen from the world. Even though I was another continent away, I felt the pain and heartbreak of this awful event, and still do. I haven’t been to the memorial, but will definitely be going to pay my respects on my next visit to NYC – and I won’t be taking any photos! It is a beautiful site and a lot of people took photos – obviously including myself. But posing and smiling felt very wrong. It certainly doesn’t justify posing in front of the Memorial unless it’s to capture someone’s sentiments for the place. It’s not a cultural difference but lack of respect – somehow many visitors deem it two pretty square fountains, rather than the haunting hollowness resonating a ghastly memory many seem to have either forgotten or feel indifferent towards. It’s like fooling around in Auschwitz: it’s simply wrong. I just cannot imagine a family waiting so long in line to go there would knowingly disrespect a place. I saw more than a few people do it and it left us completely perplexed. We visited this summer too and I can say I was in awe by this moving tribute. I don’t think it could have been designed any better. It is crowded and you do have to go through a lot of security but it is so worth it! The security is pretty insane but I understand the reasoning behind it. I agree with you I cannot imagine a better memorial. When the towers fell, I was only 15 and living in California, so it felt distant to me too. Now it feels so real and scary to me that people would do that to each other. I’d be bothered by people taking pictures too. To me, it’s a burial ground. So chilling, but so beautiful at the same time. It was a strange mix of energy, peaceful yet sombre. When they are finished it will be a beautiful park. I was told to go see the memorial, but I also felt like it might not be something that truly hit home with me. I was in high school when this happened. I ende dup not going due to the ticket situation, but I’d like to try to see it someday. I didn`t think I would be affected at all but I was surprised at how powerful it was.